COMPRESSOR WORKS BLOG - ACI Services, Inc.
Training should not be the mindset of “one and done.” Training is a journey and you have to decide the path of your journey. It is easy to sit back and let the information be presented to you, but I am sure if you do, you will be very disappointed. I am pleased to announce ACI has just recently completed the installation of our newest horizontal boring mill, KIA KBM 135 which will enable increased machining capacity. 2017 EGCR Keynote Speaker - W. Norman Shade, Jr., PE. Join us at the 2017 EGCR in Pittsburgh, PA. The benefits of natural gas are often taken for granted. We expect these classes to fill up very quickly, please ensure you are one of the first to let us know you will attend. As 2016 draws to a close, I would like to extend a sincere thank you to you, our loyal customers for helping to make our progress and prosperity possible this year. A strong Culture is a vital part of ACI! Each year around Thanksgiving, we look forward to having our annual soup cook off. Many unlined reciprocating compressor cylinders experience running bore wear. In particular, forged steel cylinders may experience significant wear in the running bore. ZANESVILLE - Zane State College and ACI Services Inc. has received the 2016 Outstanding Business Partnership award from the Ohio Association of Community Colleges. FREE eRCM Training - reserve your spot ASAP. Follow Joe's journey as he trains for Pelotonia. Follow Chad's biking journey as he bikes from Pittsburgh to D. C.
John Ernest Gower passed away on June 11, 2016.
eRCM Training sessions offered at ACI Services in multiple locations. 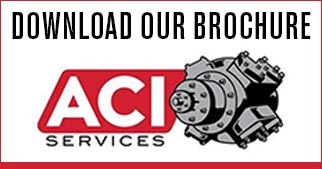 ACI Services, Inc., is well known in the industry for providing unique new-equipment solutions to the compression industry. The Gas Compressor Association recently donated $8,000 to Zane State College for its Oil and Gas Engineering Technology program. Compressor components do an enormous amount of work. Over time, they accumulate wear that can degrade compressor performance and if left unchecked, can compromise safety. To address this, ACI Services offers a complete line of replacement piston and rod options for reciprocating compressors. Modeling compressor performance curves can be complicated. That's why ACI Services, Inc., offers its free, downloadable eRCM Viewer modeling software, available for Windows-based PCs. The software operates on the Windows .NET Framework. PCs running newer Windows implementations (Vista, 7, 8, 10, etc.) are supported. Windows XT is no longer supported. ACI is offering a one-day eRCM Training Session FREE in Cambridge, Ohio on April 19th, 2016 and Pasadena, Texas on May 10th, 2016. Earlier this year, the Interstate Natural Gas Association of America (INGAA) and the INGAA Foundation launched a strategic communications campaign designed to educate everyday Americans about the benefits of natural gas and natural gas pipelines. Mr. Narku O. (Nak) Nortey passed away on October 14, 2015 after a long illness. We look forward to seeing you at the upcoming conferences this year and even more excited to show you our 3D printed models of the PAN and DVO.